I realized it had been a while since I made a new type of granola. Plus, I bought my first bag of flax seed (is it sad that I was somewhat excited about this?) and thought this would be a nice way to start using it. 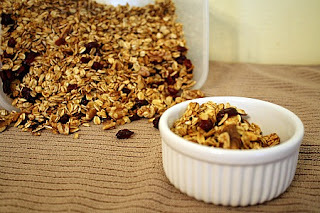 I threw together what was in my pantry that I consider “granola friendly” and was very pleased with the end result. Been loving it with my morning yogurt! Yum. Preheat oven to 300 degrees. Combine all ingredients except cranberries in a large bowl and mix. Line baking sheet with parchment and spread granola evenly on it. Bake for approximately 30 minutes, mixing it around halfway through. Let cool completely, add cranberries and mix. Store in airtight container. 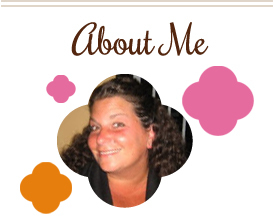 This entry was posted in breakfast, nuts, QuickAndEasy, snacks. Bookmark the permalink. Melissa, this sounds wonderful. I love a crunchy granola but the commercial ones are so high in fat, sugar and calories (and preservatives, etc.) that I don’t buy them. Granola and yogurt would be a great breakfast.